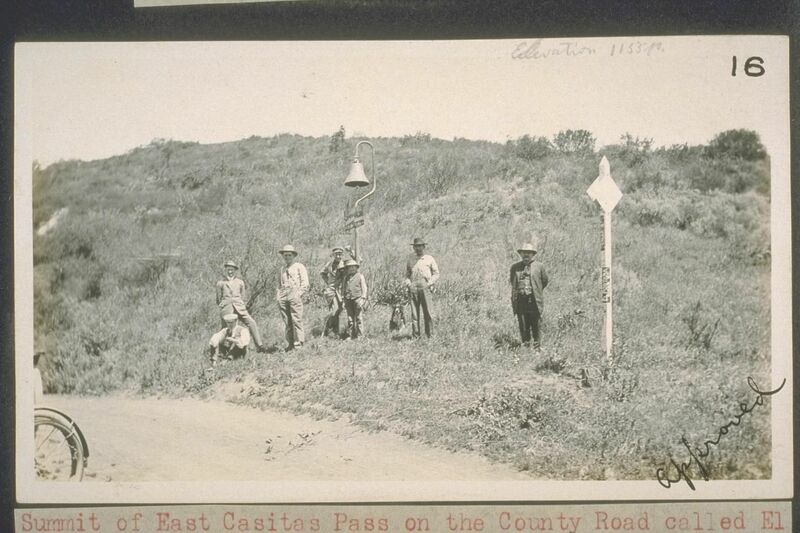 A stagecoach road was constructed over Casitas Pass in 1878. Prior to the construction of the road, the pathway across the pass between the Ojai Valley and Carpinteria consisted of little more than a trail. It was an historic trail, being part of El Camino Real; but it needed to be widened to accommodate stage coaches. It was in use as a stagecoach road for only a short while, until the arrival of rail service between Ventura and Santa Barbara in 1887. Interest in a stagecoach road over Casitas Pass was prompted by the difficult passage between Ventura and Carpinteria along the coast. Steep cliffs reached right to the breakers, and passage was commonly possible only at low tide. One of the major concerns of the Santa Barbara County board of supervisors when it met for its very first session in 1856 was how to get a road built between Ventura and Santa Barbara. The Casitas Pass stagecoach road was the first practical solution. In the middle of the 1870s, land in the Ojai and Santa Ana Valleys was subdivided. Real estate sales were promoted, and travelers’ accommodations improved. Persons interested in getting a stagecoach road constructed met in June 1875 to discuss ways and means, and representatives at the meeting were from both Ventura and Santa Barbara counties. Funding, of course, is the usual first consideration for such projects; and apparently, at the time, it was necessary for counties to obtain state approval to float bonds. That approval came with An Act to Provide for the Construction of the Casitas Pass Road, in County of Ventura, passed by the state legislature on January 12, 1878. No money was provided by the state. The county was authorized to go into debt. A contract for construction of the road was awarded to William S. McKee early in May 1874. William McKee was the owner of Oak Glen Cottages in the Ojai Valley. He had opened his cottages for travelers and health-seekers only the year before. His interest in stimulating travel between the Ojai Valley and Santa Barbara is evident, and he apparently had the skills and resources to manage construction of the road. The road itself was only the width of a stagecoach, quite narrow by current standards; but it did require real construction effort. The grade needed to be gradual enough so that horses could manage to pull heavy stagecoaches up and over both the east and west passes. McKee met the target for completion of the road, and it was accepted by the Ventura County board of supervisors in August 1878. The stagecoach road did not follow the current route of the grade which rises today from Lake Casitas to the east Casitas Pass. The current route is on the north side of the canyon. The stagecoach road climbed the grade on the south side of the canyon, and a dirt road is still visible on that side of the canyon. Fresh teams of horses were placed on the stagecoaches at both ends of the pass. In the Santa Ana Valley, at the base of the east-end grade, there was a large barn. It was sufficiently large to permit a stagecoach and team to drive into the barn, and the changing of the team was done inside the barn. That barn was located near the current Casitas Dam and stood there until 1923. At the western end of the pass, at Rincon Creek and the Santa Barbara County line, James and Belle Shepard opened Mountain View Inn in 1876 (a couple of years before construction of the stagecoach road). They were very successful in welcoming persons who were traveling to and from the Ojai Valley and Santa Barbara, and their Inn became a half-way house, enjoyed by all. The name of Mountain View Inn was changed to Shepard’s Inn in 1896, and it seemed to gain ever-greater renown (even though by that time the stagecoaches no longer ran over the pass). The quality of the food, the excellence of the service, and the scenic setting were great; and the Inn hosted famous persons, such as Theda Bara, Mary Pickford, Enrico Caruso and even President Theodore Roosevelt in 1905. The need for the stagecoach road suddenly ended when rail service was established between Ventura and Santa Barbara in 1887. Stagecoaches were still in use for a while, but only to destinations not directly served by the railroad. Completion of construction of the Rincon highway in 1912 directed most through traffic along the coastal route, and the route of the old stagecoach road retired to the status of one of California’s favorite backcountry roads. “Elevation 1155 ft.” is written in the upper right hand corner of this photograph. “1155” is printed on the 1904 USGS map. So, if one gets their hands on that map, they can figure out where the summit is located. This being the delineation for East and West Casitas Pass Road.